Powerslide World Cup Trinity speed skates - it is one of the best skates in the field of Powerskating. The Powerslide World Cup Skate is equipped with a 12.5 " long Trinity aluminum frame with 3x 125mm wheels, Abec 9 ball bearings and a 195mm mounting distance. 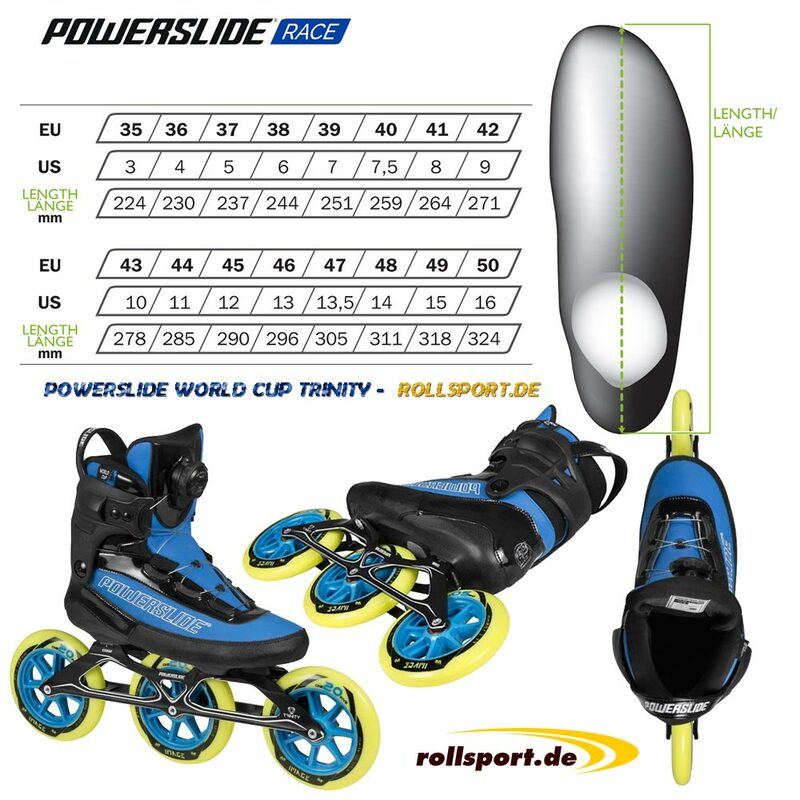 The new Powerslide World Cup Trinity Triskates totally convincing. The skate is equipped with an optimal fit. The lacing system is a very easy-to-use ATOP lacing system. On the Triple X track with Trinity technology, 3x 125mm Matter Image wheels with F1 hardness were installed. The upper shoe was equipped with very high quality material to keep even the biggest loads. The inner shoe was equipped with an 3D anatomical fit in the ankle area and all tendon areas. The poron urethane material used adapts individually to the foot during each ride. The shell of the boots consists of a micro-fiberglass and carbon composite, which makes the skate very stable. Trinity System: In the Powerslide World Cup Skate the Trinity System was used for boot and farme. The mounting points of the frame are not directly below the upper boot, but slightly offset, on the left and right side of the boot. This means that the rail adjustment with "across" and "along" offers quite new possibilities. Lacing system: The ATOP lacing system is similar to the Boa closure system. The ATOP closure system laced clockwise rotating and when opening briefly turned to the left, then the lacing jumps up. Wheels: 3x 125mm Matter image wheels with F1 wheel hardness and Wicked Abec 9 ball bearings were installed. The product video is almost like trying on the skate. You can see the skates from all sides and as often as you want.